2. 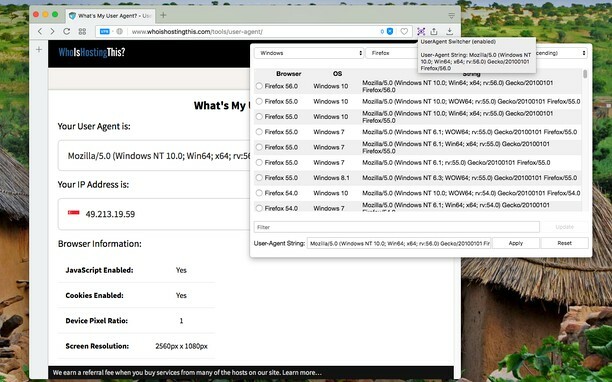 The extension uses two techniques to mimic your default "User-Agent" string which is the most reliable ways. Let me know if you found a way that the actual "User-Agent" string can be leaked. 3. This extension does not use any resource when it is disabled from the toolbar popup. 4. As of version 0.1.4, it is possible to have per-site user-agent string setting. 6. As of version 0.2.3, it is possible to have random user-agent string in the custom mode. Read FAQs page for more info. Google™ Hangouts Seen Blocker allows you to read your hangouts without notifying the sender. I loved this. Easy to use with a large database. Third user agent extension I have tried for opera but has the same problem as other two - it will disguise Opera as being Firefox but still reveals my Linux OS instead of showing as Windows, making this useless for me. Good job, does what it says. Has a nice database of user agents already. But you can add your own as well.